Most of the text in the above "meme" is directly from the linked article, so it is an indication that the article is not a bit of fluff. This seems interesting. People who pretend that religion and science are at odds and want nothing to do with anything hinting of the supernatural apparently do not realize that the Nebular Hypothesis of the formation of the solar system had its roots with Emanuel Swedenborg , who also formulated a crackpot cult that was named after him. Disenchanted members of this cult become some of the most bitter and irrational atheists one could ever have the misfortune of encountering. The idea that a huge cloud of hot gas coalesced and particles collided, fusing and forming the sun, moon planets and so on has been popular for a long time. It does not make sense even under a cursory examination, but it has been popular for a while now. After all, why let scientific evidence conflict with an anti-Creator worldview? There have been various laboratory experiments conducted to attempt to justify this hypothesis. They have failed. Some have resorted to some fascinating circular reasoning. Biblical creationist scientists do not have these problems. For over 200 years there has been the belief that the sun, planets and moons originated from a vast cloud of gas and dust, the primordial nebula or solar nebula (Lat. nebula = cloud). Celestial bodies allegedly formed when gas and dust particles coalesced in a process called accretion, forming protoplanets or planetesimals. Accretion theory is part of the nebular hypothesis of solar system formation. 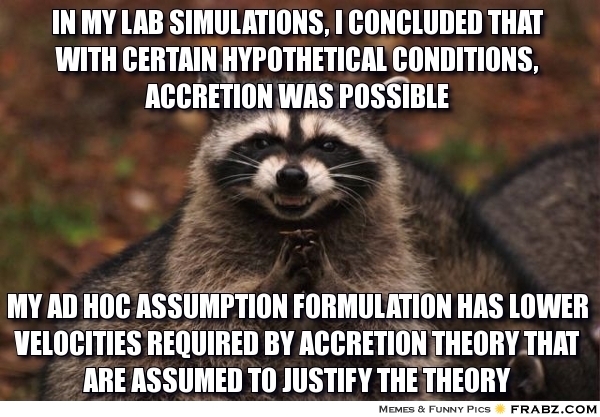 Experiments have not demonstrated that accretion occurs. God created heavenly bodies by His spoken word (Ps. 33:6), not a process—rapid or not—conforming to post-creation scientific laws. Experimental challenges to accretion theory are presented, followed by discussion of the lack of astronomical observations for it. 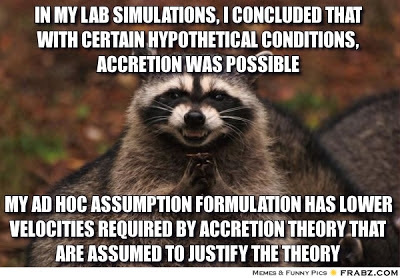 You can read about the experiments, the results and the excuses at "Solar system formation by accretion has no observational evidence".